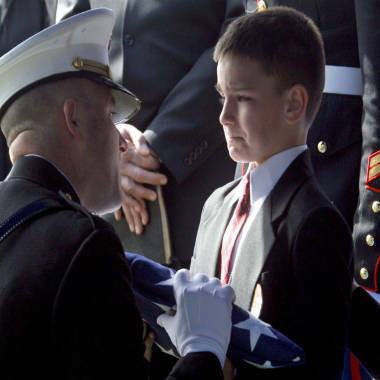 It's one of the most powerful pictures from the Iraq war: an 8-year-old, his lip trembling, is handed a folded flag at his father's funeral. The iconic image inspired a family friend - someone the young Christian Golczynski had never met - to send him a present and, later, to launch a foundation that helps hundreds of kids just like him. Every year, A Soldier’s Child sends children of fallen soldiers gifts on their birthday. Christian's father, Marine Staff Sgt. Marcus Golczynski, was killed in Iraq in 2007, so Christian was the first recipient. Now, there are 1,200 in 46 states.